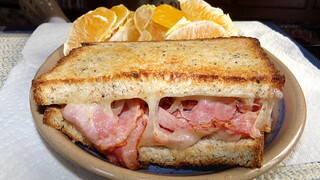 My favorite sandwich of all time has to be a Reuben, or some may call it a Rachel – but it may be a combination of both. 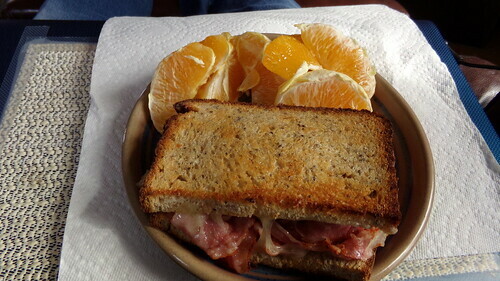 This photo is not quite indicative of the sandwich I make, way too much meat in it! I only put one layer of each ingredient in, not 19 layers as pictured here, but it’s still just as good. I make it with pastrami, but more traditionally corned beef is used. I have never had one with corned beef, and I’ve had a few of these in authentic Jewish deli’s and they seem to use pastrami, so that’s what I’m used to. Also in this is Swiss cheese and, of course, sauerkraut (or in other recipes, coleslaw); I like sauerkraut the best. I like Russian dressing also, or Thousand Island dressing as this is what I usually have on hand here. And then there’s the bread. 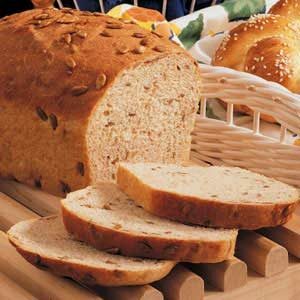 A marbled rye bread is traditional, but I like most any kind of good, thick, hearty bread like dark rye, or what I’m currently using which is called “sunflower bread” and was made in my bread machine. I finalize the sandwich by lightly buttering the outsides of the bread and toasting them in my toaster oven, flipping it over once the upper side is browned and golden. This makes for a nice melty, crunchy sandwich. The sunflower bread is very good. I had ordered a sampling of bread mixes online and this was one of them. If anyone is interested, and has a bread machine, here is one of the grouping of bread mixes at Amazon Dot Com. Actually, I ordered two different groupings of them, and here is the other one. 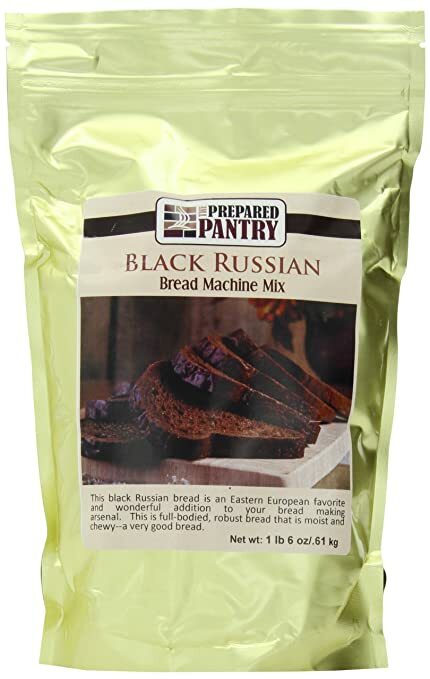 So far, I’ve made the “Black Russian” bread, the “French” bread, the “Farmhouse Honey Wheat” and now am enjoying the “Prairie Sunflower” bread. All were excellent and highly recommended. They come from the Prepared Pantry company which makes many different bread mixes. Now that I’m browsing around in that amazon page of all the different bread mixes they offer, I’m going back for a closer look. So far I’ve only ever made a bread in my bread machine right through to the end, and the resulting loaf always comes out kind of short and compact due to the shape of the bread pan. I’ve read how you can let the machine do all the work of preparing the dough and when it’s time to just rest and then bake it off, you can remove it, put it into a bread pan of your choice, or shape it into a long thin loaf, and bake it right in the oven for the last 35 or so minutes. I keep meaning to try this technique but so far I haven’t done it. Maybe with my next bread I will. When I make one of these Reuben/Rachel sandwiches, I’ve been using only ONE slice of bread and cutting it in half – my last loaf of bread came out so tall that cutting it in half was almost like making a regular sized sandwich anyway! So that’s it from here. There is almost no snow left on our property, just some around the edges that is rapidly melting away! Makes me very, very happy indeed. Now if the little bulbs would start to pop thru the earth, it would be just like a real spring! I like warm food but I’m not much of a sandwich eater except for grilled cheese with tomatoes though these sandwiches do look good. My parents use to make hot pastrami sandwiches on light rye bread once in while. No sauerkraut though. B doesnt like either, so its never been on menu here. Though I may get it soon, since I have been craving it. Now I’m hungry, too! That looks delicious! My friend just got her very first job at Arby’s, Maybe she will make me a killer Reuben. It only takes me a few minutes to make the Reuben Eric. I put a can of sauerkraut into a plastic container in the fridge and the pastrami and Swiss cheese are in baggies, so it’s a little assembly line at the toaster oven area! I heat up the pastrami first in the microwave before I stick it in the sandwich so it will get warm quicker and the cheese will melt easier. I only make a half-sandwich at a time. Teri, yes, that song I remember from an early age – not sure where or when but maybe from school. Bex, the only knowledge I have of that song is that it appears to be tied into my childhood, from sometime before I left Seattle. I’m thinking I probably learned it during elementary school. I agree. 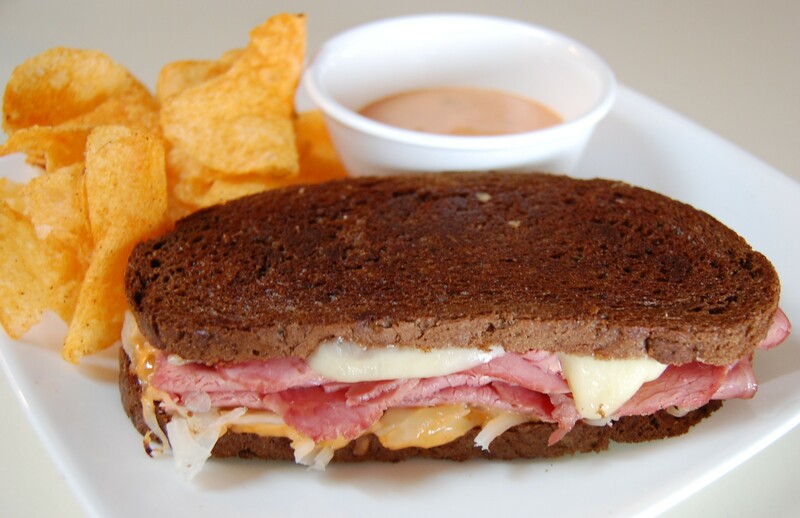 There’s no better sandwich than a Reuben. Of course making one yourself entails a lot of effort! Would you believe we’ve just has a two inch snowfall this afternoon! That song, Reuben Reuben I’ve been thinking… what a fine world this would be, if the men were all exported, far beyond the northern sea… That’s what was going thru my head as I typed out this entry. I don’t put the title in til I’ve done the whole entry normally, and that’s what I was thinking. Teri, was that your song too? I don’t think I’d sung it or heard it since grade school! Bex, you opened my mind to a song from childhood, “Reuben, Reuben”. I’d totally forgotten it! Then on seeing the title of your journal I could taste it, and I knew a tiny part of how the song would go. Then I looked it up on google just now and I remember it. The snow is melting and the menu is melt in your mouth! I love those sandwiches too! Lucky Paul! Happy Easter! I just had one! I made myself hungry! It was so good. Bex, I’d love to have one no matter how you care to make it. Sounds so yummy! Your blog makes me hungry. That sandwich looked so good. Unfortunately, most of the ingredients are on my don’t like list. I love Roast Beef, but if it is cured or pickled or spiced up like Pastrami and Corned Beef, and I’ll have to say no thank you. I would rather have horseradish than sour kraut. And I can’t stand rye. Never have. The last loaf of bread I bought was 24 grain.